MOABS | The Mother of All Baby Showers | When Your Child is Ill, What Does More Serious Mean? What does a doctor mean by "more serious"? When a child is ill, a lack of appetite is expected and okay for a few days or so. But a child that is refusing to drink is very concerning. Dehydration may also happen if your child has a stomach bug and IS drinking fluids - but cannot keep anything down due to frequent vomiting or diarrhea. It’s normal for your child to breathe a little bit faster when their nose is congested or their fever is high. However, if your child is breathing in hard despite nasal suctioning to remove mucus, fever control and—if needed—being given their asthma medication, then a medical provider should be contacted. Signs of breathing difficulties include being able to see the spaces in between their ribs during their deep breaths, flared nostrils when breathing or being unable to eat, drink or talk very well due to their breathing difficulties. These are signs that your child needs extra help! Sometimes a medical provider will say that an illness has turned into something “more serious” when a secondary infection has occurred. For example, a cold can turn into pneumonia. Keep an eye on fevers that last longer than 5 days—a fever is a body temperature greater than 100.4 degrees fahrenheit. Fevers greater than 102.2 degrees fahrenheit can also be a sign of something more serious in children under 3 years old. If your child has worsening cough and sinus symptoms for more than 10 days, a cold that was getting better and then suddenly gets worse, or very severe cold symptoms, you should contact a medical provider. Any changes in mental status—like if your child acts extremely sleepy or unable to play—are symptoms to look out for that should be brought to the attention of your healthcare provider. For infants, increased fussiness may be a sign that they are in pain, and so it should also be evaluated. If you have any questions or concerns about your child’s health, you should always contact your primary care provider just to be safe. 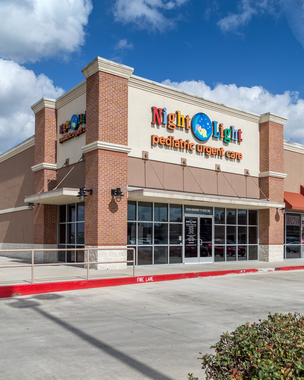 NightLight Pediatric Urgent Care is here to support you after hours when your pediatrician’s office is closed at their 7 convenient NightLight neighborhood locations. We are excited to announce NightLight Pediatric Urgent Care now offers Telemedicine! This new service can be utilized to better care for your little star—in a way that works best for your situation. When your child is sick, having immediate access to a trusted and convenient after-hours resource is critical. Now you can work with the same providers you've trusted in their clinics straight from the comfort of your home. Sign up here for their monthly medical mindset newsletter! Their pediatric providers will tackle a different topic ranging from antibiotic education to rashes to the flu, and much more.